There is a plethora of evidence within Økland's 2012 NTNU dr.philos. Thesis to demonstrate Økland and her 2012 NTNU dr.philos. Thesis fall well outside of the the ethos of scholarship, academic integrity and independence required of an NTNU doctoral thesis. There are serious questions with respect to the 4 "joint works," i.e., the 4 NCFM eSnurra Group papers included within Økland's 2012 NTNU dr.philos. Thesis which contain a total of 20 authorship credits among 8 NCFM eSnurra Group authors. Furthermore, Økland's 2012 NTNU dr.philos. Thesis is replete with intentional acts of omission and distortions of important, highly relevant facts, information and issues. Consequently, Økland's 2012 NTNU dr.philos. Thesis resulted in a publication which is more akin to an agenda-driven, competitive medico-marketing publication, with Økland acting like an agent for NCFM eSnurra Group's agenda, instead of a doctoral thesis meeting NTNU's ethos of scholarship, academic integrity and independence requirements. 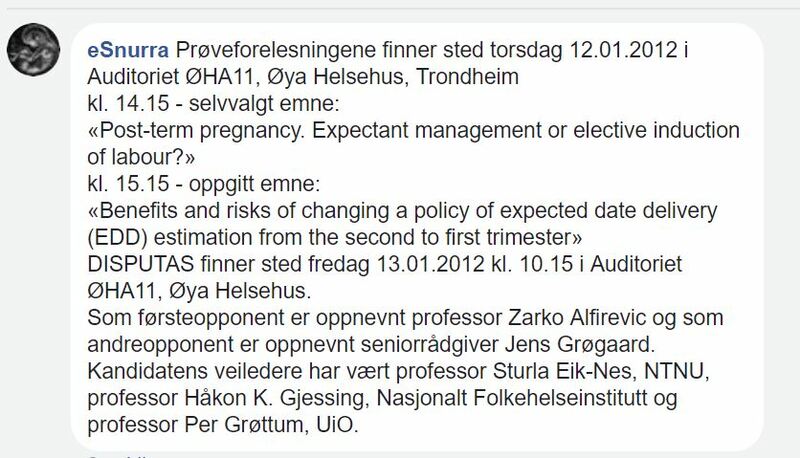 The eSnurra Facebook page promotes Økland's 2012 NTNU Thesis defense (see image below). Interestingly, eSnurra is identified as a "Medical Company in Trondheim, Norway" on the eSnurra Facebook page (https://www.facebook.com/pg/esnurra/). The National Center for Fetal Medicine's eSnurra website (http://www.nsfm.no/esnurra/) is not identified on the eSnurra Facebook page. The eSnurra Facebook page neither mentions nor identifies any association between eSnurra and the Norwegian National Center for Fetal Medicine (NSFM/NCFM) or St Olavs Hospital (Trondheim University Hospital). In short, "eSnurra" is presented and promoted as a private "Medical Company" on Facebook, consistent with the copyright of "eSnurra" claimed by 3 individuals (© eSnurra, Eik-Nes, Gjessing og Grøttum), the 3 original members of NCFM eSnurra Group who were also the 3 supervisors of Inger Økland's 2012 NTNU Thesis (image below). "...and doctoral [i.e., Økland's 2012 NTNU dr.philos. Thesis] that tests how the methodology stands against competing methods." However, the article which used to be available at the URL above is available via the two sources, with active URLs, included below. Inger Økland remains prominently featured on the www.esnurra.com homepage where NCFM eSnurra Group intentionally misrepresent Inger Økland's academic credentials. Specifically, NCFM eSnurra Group intentionally misrepresent NTNU had conferred a PhD degree upon Inger Økland instead of a dr.philos degree. Also, NCFM eSnurra Group intentionally misrepresent Okland's Thesis as an NTNU PhD Thesis/Dissertation. There is a big difference between an NTNU PhD degree and an NTNU dr.philos. degree, just as there is a big difference between an NTNU PhD Thesis/Dissertation and an NTNU dr.philos. Thesis. The intentional, deceptive misrepresentation of Økland's academic credentials is made obvious by what it stated stated on page 3 of Økland's 2012 NTNU dr.philos. Thesis: "Principal Supervisor: Sturla H. Eik-Nes, MD, PhD , Co-supervisors: Håkon K. Gjessing, PhD & Per Grøttum, MD, PhD." Moreover, these same 3 NCFM eSnurra Group members are the 3 claimed copyright owners of NCFM eSnurra (© 2017 eSnurra / Eik-Nes, Gjessing and Grøttum), as stated on the "eSnurra" website (www.esnurra.com). Attributing the iconic degree credential "PhD" to Økland and her thesis is a blatant misrepresentation. NTNU conferred a dr.philos. degree upon Inger Økland in 2012, not a PhD degree. This blatant misrepresentation of academic credentials is a breach of medical ethics for doctors; and although this is not stated in her thesis, Inger Økland was, and is, a medical doctor. This was, and remains, a standard NCFM eSnurra Group conflate-to-obfuscate strategy. An NTNU PhD degree and dissertation is not synonymous with an NTNU dr.philos. degree and dr.philos. thesis. These are 2 completely different degrees with 2 different sets of NTNU regulations articulating different academic, supervision and thesis defense requirements. Consequently, there was, and remains, confusion regarding Økland's 2012 NTNU dr.philos. Thesis, on multiple levels. Most people were intentionally led to believe Økland had been conferred an NTNU PhD as a result of 2 articles published in Tidsskr Nor Legeforen. The first public misrepresentation was included in the 2012 NTNU PhD degree announcements (included below). "Inger Økland, ph.d. Biases in second-trimester ultrasound dating related to prediction models and fetal measurements. Utgår fra Institutt for laboratoriemedisin, barne- og kvinnesykdommer. Disputas 13.1. 2012. Bedømmelseskomité: Zarko Alfirevic, University of Liverpool, Storbritannia, Jens Grøgaard, Helsedirektoratet og Liv Bente Romundstad, Norges teknisk-naturvitenskapelige universitet. The second, was by Torunn Janbu, Head of the Department of Hospital Services, Norwegian Directorate of Health, in her article "One Norwegian national tool for estimating date of delivery and fetal age" in Tidsskr Nor Legeforen nr. 9, 2016; 136: 790 – 1, p. 790. In this article, Torunn Janbu represented Økland's 2012 NTNU dr.philos. Thesis as independent, academic justification for Directorate of Health's decision to select NCFM eSnurra Group's "method" (i.e., the appropriated, plagiarized, misused Hutchon Method of PDEE) as the exclusive implementation vehicle for Directorate of Health's medically & ethically flawed 2014 Recommendation with their government-mandated protocol of evidence-obviated medicine. However, Directorate of Health, Torunn Janbu and Jens Grøgaard knew NTNU had not conferred a PhD degree upon Inger Økland. Note the Norwegian and English version excerpts from Torunn Janbu's article below. The Norwegian words "doktoravhandling" (doctoral thesis) and "doktorgraden" (doctorate) were translated (not by software) into English as "PhD thesis," thereby misrepresenting Økland's academic credentials. Again, NTNU did not confer a PhD degree upon Inger Økland; NTNU conferred a dr.philos. degree upon Inger Økland, of which Directorate of Health and Torunn Janbu were aware. § 4 A doctor may only use such titles and designations as his or her education and position entitle him to. He or she may not use titles and designations which may give an erroneous impression of his or her qualifications and work. Jens Grøgaard, Senior Adviser, Directorate of Health, worked closely with Torunn Janbu to formulate, decide and implement Directorate of Health's medially & ethically flawed 2014 Recommendation; and, Jens Grøgaard was a member of Økland's 2012 NTNU dr.philos. Thesis Assessment Committee, as stated in the Degree Announcements published in Tidsskrift for Den norske legeforening (above); and, Jens Grøgaard had adjudicated the public defense of Økland's 2012 NTNU dr.philos. Thesis; consequently, he was well aware Økland had been conferred an NTNU dr.philos. degree, and not an NTNU PhD degree, as had been misrepresented by Torunn Janbu of Directorate of Health. There is no evidence corrections were requested of Tidsskrift for Den norske legeforening by Inger Økland, or Torun Janbu, or Jens Grøgaard, or Sturla H. Eik-Ness (NCFM eSnurra Group leader and Økland's Principal Thesis Supervisor). If the Editor of Tidsskrift for Den norske legeforening had been informed of the need for "a correction of a statement of a factual nature" in 2 separate articles, published in 2 separate issues of Tidsskrift for Den norske legeforening (nr. 3, 2012; 132 and nr. 9, 2016; 136), of which both articles were in need of the exact same factual corrections, i.e., the degree NTNU had actually conferred upon Inger Økland and the degree which had been attributed to Økland's Thesis had been attributed, an NTNU dr.philos. degree, not an NTNU PhD degree, then the Editor of Tidsskrift for Den norske legeforening would have been bound by Norwegian law to publish timely corrections. It is not likely nor is there evidence to suggest the Editor of Tidsskrift for Den norske legeforening received 2 separate requests for "a correction of a statement of a factual nature" and then twice ignored Norwegian law (below). "Section 430. The editor of a newspaper or periodical shall be liable to fines if he refuses to print unaltered a correction of a statement of a factual nature in the newspaper or periodical if this is requested within one year by any person whom the statement directly concerns and the correction is limited to a statement of a factual nature and does not contain anything of a criminal nature. The editor may, moreover, be enjoined, by means of a continuous daily fine, to print the correction. A refusal is deemed to have been made if the correction is not published in the first or second issue of a newspaper, or the first issue of a periodical which was not ready for printing when the correction was requested, in as prominent a place as the statement to be corrected and generally made up in such a way as is required by good press usage. the only publicly available document identified by Directorate of Health to justify their selection of NCFM eSnurra Group's "method." Interestingly, although not surprisingly given "the fix," Inger Økland is now in her second year of employment with Directorate of Health. See "The Fix"
Furthermore, Økland's 2012 NTNU dr.philos. Thesis states (p. 3): "Principal Supervisor: Sturla H. Eik-Nes Bive, Co-supervisors: Håkon K. Gjessing and Per Grøttum; the 3 original members of the NCFM eSnurra Group; the 3 coauthors of NCFM eSnurra Group's Eik-Nes et al. 2005 and Gjessing et al. 2007 the first 2 NCFM eSnurra Group publications to have appropriated and plagiarized Dr. Hutchon's original idea and method, the Hutchon Method of PDEE; the 3 NCFM eSnurra Group members who claim to be the NCFM eSnurra "copyright owners" (© 2007 Eik-Nes, Grøttum og Gjessing). Moreover, Økland had been working and publishing with NCFM eSnurra Group since 2007. Consequently, Økland and her 2012 NTNU dr.philos. Thesis did not represent independent academic scholarship and were clear, direct conflicts of interest. Finally, it is interesting to note while Torunn Janbu misrepresented Økland's academic credentials, she decided not to identify Økland's MD credential with a specialty in obstetrics, which was strange given obstetric medicine was (and remains) the primary issues regarding Directorate of Health's knowledge-obviated, medically & ethically flawed 2014 Recommendation. And, finally, Torunn Janbu did not identify Inger Økland as a member of NCFM eSnurra Group nor did she disclose that Økland's 2012 NTNU dr.philos. Thesis had been supervised by Eik-Nes, Per Grøttum and Håkon K. Gjessing, the 3 NCFM eSnurra Group members who claim to be the "copyright owners" of the NCFM eSnurra "method" (i.e., the appropriated, plagiarized, misused Hutchon Method of PDEE). Nor did Torunn Janbu disclose Jens Grøgaard, Senior Adviser, Directorate of Health had been a member of Økland's 2012 NTNU dr.philos. Thesis Assessment Committee and had adjudicated Økland's public defense. However, in the article "Feilkilder ved ultralydbasert terminfastsettelse i 2. trimester, relatert til prediksjonsmodeller og målinger" in Flaggermusen, Inger Økland's degree is identified as "dr.philos." And, in Inger Økland's personal profile at ResearchGate.net her degree is identified as "Dr. Philos." Moreover, Økland's 2012 NTNU dr.philos. Thesis states: "Thesis for the degree of Doctor Philosophiae" on the front cover/page which corresponds to the NTNU Doctor Philosophiae (dr.philos.) degree, not the Philosophiae Doctor (PhD) degree. And, the Bibsys NTNU Open: Full Item Record: Inger Økland's 2012 NTNU Doctoral Thesis has the following table entry: "dc.description.degree Dr.philos." According to NTNU's: REGULATIONS FOR THE DEGREE DOCTOR PHILOSOPHIAE (DR.PHILOS.) AT THE NORWEGIAN UNIVERSITY OF SCIENCE AND TECHNOLOGY (NTNU) a Doctor Philosophiae is the "dr. philos." degree. Simply reversing the word order from Philosophiae Doctor to Doctor Philosophiae is confusing, especially with respect to language translations. In fact, the "dr.philos." degree or "Doctor Philosophiae" could not have been engineered to be any more confusing with a PhD degree, which may have been the point. There are 4 items of evidence to support NTNU conferred a dr.philos. degree upon Økland and 3 items of evidence to support NTNU conferred a PhD degree. However, the considerable reach of the 2 PhD ascribing articles in Tidsskrift for Den norske legeforening dwarf all publication-based communication channels with the message NTNU had conferred a dr.philos. degree upon Økland, not the PhD degree promoted in the article by Torunn Janbu of Directorate of Health and the Degree Announcements article, both published in Tidsskrift for Den norske legeforening. NTNU states: "A PhD degree is the highest level of formalized education in Norway." the regulations of the respective institutions for the degree of Dr. philos." NTNU conferred a Doctor Philosophiae (dr.philos.) degree upon Økland. Consequently, Økland was required to adhere to the associated NTNU regulations for a dr.philos. degree, as defined in NTNU's published "REGULATIONS CONCERNING THE DOCTOR PHILOSOPHIAE DEGREE (DR. PHILOS.) AT THE NORWEGIAN UNIVERSITY OF SCIENCE AND TECHNOLOGY (NTNU)" Included below are important, highly relevant excerpts from the NTNU dr.philos. degree regulations which applied to Økland's 2012 NTNU dr.philos. Thesis and degree. "Dr. philos. is a non-supervised degree." Note: Økland's 2012 NTNU dr.philos. Thesis explicitly states (p. 3, bottom) it was supervised by Sturla H. Eik-Nes and co-supervised by Håkon K. Gjessing and Per Grøttum; the 3 original members of NCFM eSnurra Group, the 3 NCFM eSnurra Group members who claim to be the NCFM eSnurra "copyright owners" (© 2007 Eik-Nes, Grøttum og Gjessing); the 3 coauthors of NCFM eSnurra Group's Eik-Nes et al. 2005 and Gjessing et al. 2007, the first 2 NCFM eSnurra Group publications which appropriated and plagiarized Dr. Hutchon's original idea and method, the Hutchon Method of PDEE, and claimed Dr. Hutchon's original idea and method as their own original idea and method. However, Økland's 2012 NTNU dr.philos. Thesis and degree were defined by NTNU as a "non-supervised degree," unlike the NTNU PhD degree which is fully supervised. Moreover, Økland was not entitled to NTNU supervision, nor any thesis supervision, nor was it even possible because her application and her "doctoral degree thesis" were required to be submitted together on her first contact with NTNU. Consequently, the inclusion of Sturla H. Eik-Nes as principal supervisor and Håkon K. Gjessing and Per Grøttum, as co-supervisors, appears to be intentionally deceptive so as to give the distinct impression Økland's 2012 NTNU dr.philos. Thesis was a fully supervised NTNU PhD dissertation, an entirely different, more rigorous undertaking requiring advanced academic course work as stated in NTNU's published regulations and requirements for candidates of an NTNU PhD degree. "The application is to be submitted together with the doctoral degree thesis. (To whom was Økland's application and Doctoral Thesis submitted?)" Part of a joint work may be approved for evaluation also as one of several pieces of work. Note: The 3 published and 1 unpublished papers included in Økland's 2012 NTNU dr.philos. Thesis had a total of 20 authorship credits, among 8 authors. The 3 published and 1 unpublished papers in Økland's Doctoral Thesis, as submitted, are each a joint work. Økland's contribution to each of the 4 joint works must represent an independent contribution that can be identified. (Note: Økland's 2012 NTNU dr.philos. Thesis presented by NTNU Library as an original on 11.05.2017 did not identify Økland's independent contributions to the joint works as required by NTNU's regulations. Økland's Doctoral Thesis must include a signed declaration for each joint work that describes: 1) Økland's contribution and 2) the contributions of each of her 16 co-authors. Note: The first 3 co-authors listed above are the original members of NCFM eSnurra Group and the 3 claimed copyright owners of NCFM eSnurra (© 2007 Eik-Nes, Grøttum og Gjessing). Moreover, these same 3 NCFM eSnurra Group members (Eik-Nes, Grøttum og Gjessing) are identified as Økland's thesis supervisors. "Five (5) copies of the thesis, bound or stitched, are to be submitted." "A piece of work that has been submitted cannot be withdrawn until a final decision is reached as to whether or not it may be approved for defense for the doctoral degree." "If the committee finds that extensive changes related to the theory, hypothesis, material or methods used in the thesis are needed in order to deem the thesis worthy of a public defence, the committee must reject the thesis." "The thesis must be made available to the public no later than three (3) weeks prior to the date of the public defence. The thesis should be made available in the form in which it was submitted for assessment, or following revisions made on the basis of the committee’s preliminary comments; cf. Section 7.2.​"
"No restrictions may be placed on a dr. philos. thesis being made publicly available." It is important to revisit paragraph 5 of "Section 3 Thesis" of NTNU's Doctor Philosophiae (dr.philos.) thesis regulations and degree. It is interesting and disturbing to note Økland's 2012 NTNU dr.philos. Thesis, as presented by NTNU Library as an original copy on 11.05.2017, did not meet NTNU's regulations as stated in "Section 3 Thesis". ​"Part of a joint work may be approved for evaluation (also as one of several pieces of work, cf. Section 4), provided that the candidate’s contribution represents an independent contribution that can be identified. A thesis containing pieces of work written by more than one author is to include a signed declaration that describes the contribution by the candidate and the co-author(s) of each piece of work, and the consent of the co-author(s). It must be possible to identify the candidate’s independent contribution in the work." NTNU's regulations for a dr.philos. degree required signed declarations for each joint work in an NTNU dr.philos. thesis. In this regard, NTNU's dr.philos. "Section 3 Thesis" regulations had been well aligned with (if not ahead of) the thinking of ICMJE regarding author contributions' identification. This is especially relevant considering Økland, the most junior member of the NCFM eSnurra Group, had been credited as the lead author on each of the 4 joint work papers with a combined total of 20 authorship credits among the 4 papers included in Økland's 2012 NTNU dr.philos. Thesis when "the authorship credit and order should be based on the relative scholarly abilities and professional contributions of the collaborators." Moreover, NTNU was aware of the proliferation of gift authorship which"
The obvious question: Who at NTNU allowed Økland and her dr.philos. thesis to subvert NTNU's regulations and requirements? Specifically, "Section 3 Thesis" of the regulations and requirements clearly and explicitly stated that a signed declaration for each of the 4 joint works (i.e., a total of 20 authorship credits among 8 total authors) were to be included within Økland's 2012 NTNU dr.philos. appropriated and plagiarized the idea and approach used in the introduction to her 2012 dr.philos thesis from Dr. Hutchon's seminal Hutchon 1998, published 14-years earlier, to introduce his original idea and method, the Hutchon Method of Population-based Direct EDD Estimation (PDEE); the method upon which Økland's 2012 NTNU dr.philos. Thesis was based, entirely, without attribution to Dr. Hutchon for the Hutchon Method of PDEE. Aristotle, the father of scientific thinking, wrote that there was a certain definite term of gestation for all animals which varied from animal to animal according to its size and life expectancy. However in man, wrote the philosopher, "the human foetus is expelled both in the seventh and tenth months, and at any period of pregnancy between these; moreover, when the birth takes place in the eighth month it is possible for the infant to live." (Harvey 1647) William Harvey, writing in the early 17th century, thought that women were most prone to conceive either just before or just after the menstrual flux. It was however Harmanni Boerhaave (1744) who formulated a way of calculating the expected date of delivery, and the rule was later given publicity by Franz Naegele (Naegele 1812) to whom it is named after today. 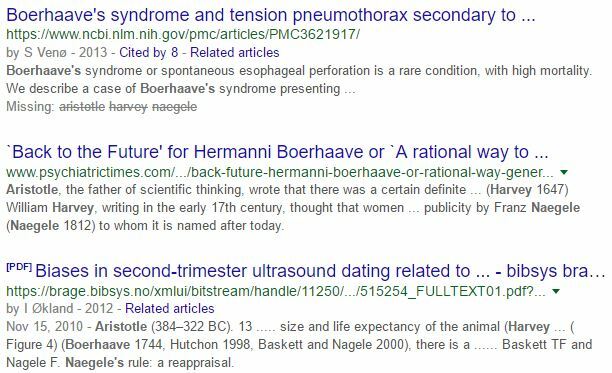 ​Finally, if one does a Google Search for the 4 historical names: "Aristotle Harvey Boerhaave Naegele" (with or without the quotation marks), the fist search result that includes all 4 of these historical names is Dr. Hutchon's seminal Hutchon 1998: "`Back to the Future' for Hermanni Boerhaave or `A rational way to generate ultrasound scan charts for estimating the date of delivery'" (see image below, middle result), directly followed by Inger Øakland's 2012 NTNU dr.philos. Thesis: "'Biases in second-trimester ultrasound dating related to prediction models and fetal measurements." This is evidence of the uniqueness of the "Introduction" Dr. Hutchon wrote and included in his seminal Hutchon 1998; a paper which has been available on the Internet since July, 1998, 14-years before Inger Øakland's 2012 NTNU dr.philos. Thesis.